I had a moment this week. (Yes, I know it’s only Tuesday and I’m calling it “this week”–but it’s been one of those weeks already.) And while I’m dying to talk about these tacos (oh my god, seriously, look at them! ), I want to spend a few minutes exploring what happened. And why it mattered to me. And maybe matters to you? For years now I’ve read blog post after blog post, article, essay, even entire books, about The Power of Saying No. And it sounded like a great concept. Simplifying. Sticking to your guns for what you do (and enjoy doing). Focusing on quality over quantity. See, I’d been a student for so long, juggling class and work and writing a thesis and all that stuff that somehow, even though I had so much on my plate, it wasn’t tough. There’s something about those irregular days–working odd hours at part time jobs, taking time in the middle of the day to swim a mile or hike–that still allows for creativity. Even thought I was constantly “doing,” and at times super stressed, it still all worked. And everything I did was essential–there’s no cutting out writing papers or working in order to put food in your mouth. Then “real life” hit. That post-grad school subpar reality of the 8-5 (or 6 or 7…). The student loans you’ve got to pay back. The settling down a little (though I wouldn’t trade it). For me, I responded by starting a freelance business this year–food writing and photography, what’s not to love? And it is amazing. But it is stressful and, frankly, if I didn’t need the money, I’m not sure I’d be doing it right now. I feel like I’m at loose ends. Yesterday (was it only yesterday?) I was given a list of shots I needed to get in by the end of the week for production. The shots I’d missed. No biggie–I was expecting those. But on that list was a detailed assignment for shooting the cover photo of this magazine client. Sounds like an amazing opportunity, right? Well, for me, my reaction was to have a panic attack. A real one. See, I don’t style food–I shoot it the way it’s served and styled by others. I also use natural light and natural surroundings. I don’t prop photo shoots or use lights or lightboxes. I like the way food can speak to people through simple preparation and presentation. This isn’t to say that my aesthetic and views won’t change, but, for now, that’s who I am. And styling a plate of food for a cover photo with a solid colored background, most likely needing a light box, just isn’t me. And I didn’t have the time. But I felt like I was letting my client down and perhaps even forfeiting some of the gigs they give me if I said no. Not “no” because I’m letting someone down or “no” because I’m not talented or “no” because I don’t care–it’s “no” because I do care about my work and I want to stay true to it. “No” because I need to focus a little (just a little) on myself (like when was the last time I went to yoga or ran or swam?). “No” because I need liberation from stress. And you know what? It was ok–they just assigned the cover shot to another photographer and there weren’t any hard feelings. So that’s “no” for you. So simple, so not negative–who knew? But I’m getting away from the tacos that brought you here, aren’t I? 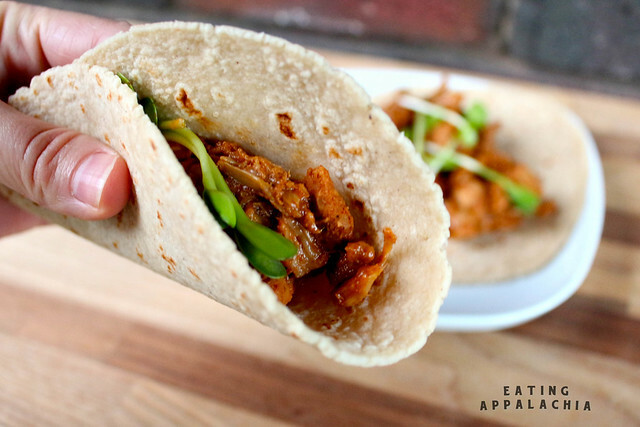 These tacos are anything but a “no”–they’re hands down a “yes.” A “yes” for indulging in plant-based, gluten-free, super flavorful tacos that, amazingly, really do mimic the real thing. This ain’t no mock meat, “vegan-tasting” (for those who look down their noses as plant-based food) taco for you. Jackfruit, obviously, is an amazing little fruit. The fresh thing is lime-yellow green, covered in bumps, and looks like it dropped down from the moon, but it’s most accessible in canned form (available at your local Asian market). I’ve written about it before (as have others), but, even though I loved my first foray with the fruit, I haven’t played with it again until now. Which was stupid, to be blunt. Anytime I find myself at a reputable Mexican restaurant (authentic, not Tex-Mex), I can’t help but order tacos or sopes Al Pastor–that wonderful Middle Eastern influenced Mexican fusion meat of pork marinated in chilies, cooked on a schwarma-esque rotisserie with pineapple. It’s the amazing combination of earthy heat from the chilies and bright sweetness from the pineapple that hooked me in the first place and I figured it had to be recreatable with jackfruit. And oh was it recreatable. Amazingly, the dish took a mere 20 minutes to prepare, so it’s fanatically week night friendly, and probably kid friendly if your kids are into medium-spicy dishes. The chili powder and chipotle, even though it sounds like a lot, is actually very tempered by the pineapple and gives a low, warming heat to the jackfruit–though if you’re worried about heat, just add one chipotle to the sauce. Serve with guacamole or the traditional cilantro and minced onion (I have sunflower sprouts in the picture) and you’re good to go with an authentic vegan taqueria experience. Just add margaritas, right? Place all sauce ingredients in a blender. Blend until smooth. Set aside. Warm the coconut oil over medium heat on the stove in a large skillet. Drain the jackfruit and rinse. Add the jackfruit to the skillet and cook, constantly stirring and breaking apart the jackfruit chunks, for 10-15 minutes. As the jackfruit browns and cooks, it will begin to fall into shredded pieces resembling pulled pork–this is what you’re going for. Add the sauce to the pan and stir to combine. Add the remaining 1/2 a pineapple, stir to combine. Cook another 3-5 minutes to warm the sauce and cook down any excess. Serve on warm tortillas with your garnish of choice. Oh, it has been a week… “No” is always the best, and the worst, thing to say. I’m absolutely in the same situation, and am so proud of you for owning your “no.” I’m not sure I could be so strong, but it was definitely the right thing to do. What garnish did you use? Cilantro shoots? It looks quite delicious! Oh man! I’m so glad you could get some of that stress off your plate–and out tacos on it instead. Tacos make everything better, right? I’ve never tried the jackfruit trick, but this may have to change soon? good for you! i had a similar “no” situation happen to me a couple of months ago. i was beside myself because it was such a great opportunity, but unrealistic for me to accomplish it within the allotted time frame without it being total crap. dayv kept telling me i should bc it was such a big deal, but i just couldn’t say yes with a clear conscience. and i’m so glad i did. Good on you for drawing the line! Your tacos look delish, love the sound of the ingredients in your recipe. I haven’t cooked with jackfruit for a while as I’ve found it can be a bit too light and doesn’t fill my greedy fellows up enough. Great looking tacos and good for you for saying no! Sometimes instead of saying no, I say maybe. If what the client wants is not quite what I do, I propose something else that I can do and that maybe they haven’t thought of. But if it really is something I don’t do, it’s best just to say so up front. Usually, they understand and if they don’t, then it’s probably someone you don’t want to work with anyways. And, those tacos look awesome. 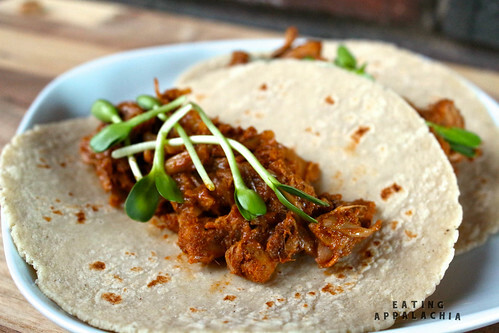 I’ve never tried jackfruit or a sweet-savory taco. Def going to try these. I know what you mean about both school life (always busy, but with a flexibility built in) vs. “real” life, and I have to say – I prefer being in school! I’m glad you figured out how to say no, find a little balance, and stay true to your vision. I’ll have to keep this in mind as I start to feel overwhelmed (which happens more than it should!). Right… just add margarita! Those look good! i’m sorry, I’m from the North originally, but have never heard of Jack Fruit, where do you find that? I live in the south now do you think I can find it down here?